The Meadows master planned community is a family friendly Castle Rock community that offers a lot of wonderful resources to help you stay connected. Wondering when the next playgroup is? Got something to sell? Looking for a babysitter? MeadowsLink.com is your resource for everything happening in The Meadows community. From Odette’s cooking classes to architectural guidelines, and the homeowners’ associations newsletter you will find it all here. Don’t miss out! See what’s happening in The Meadows community today. Check out our news and events page, like our Facebook page for community updates or dowload the Meadows Community Phone App to stay connected. 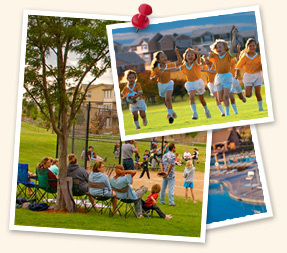 MeadowsLink.com is another great resource for information about our Castle Rock community and the homeowners’ association’s newsletter. to us for more information on rental. Douglas County school district is one of the highest performing school districts in Colorado.